Kanakia Paris the luxury project to Arrive in Bandra Kurla Complex in Mumbai. The project offers well-designed 2 and 3 BHK apartments for sale. Kanakia Paris is the latest residential project offered by Kanakia Spaces Group located at Bandra Kurla Complex in Mumbai. Currently the project is under construction. The apartments available in the different sizes ranging from 578.00 sqft to 1396.00 sqft (Carpet Area). Kanakia Paris is designed over an area of 2 acres. The possession is likely to be in September 2018. 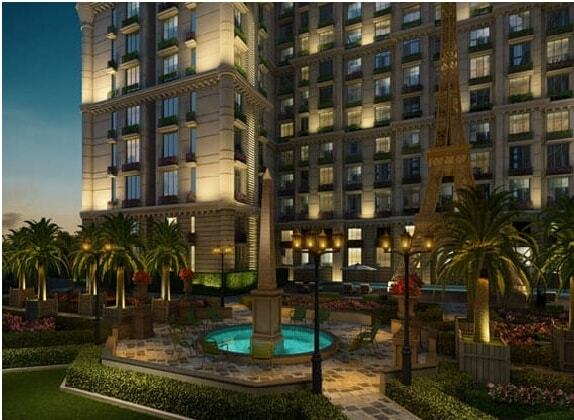 Kanakia Paris is a residential luxury project which is prelaunch in Bandra Kurla Complex Mumbai. The proposed residential development spread over a 2 acre land parcel is being developed as a Themed Residential project. It presents luxurious 2 BHK, 2.5 BHK, 3 BHK & 4 BHK flats where area ranges from 578.00 sqft. - 1396.00 sqft. (Carpet Area) There will be an Eiffel Tower of Paris-based structure in the project of Kanakia. It will be a combination of 7 towers and each towers will have 19 floors. This area is particularly fresh and comfortable. Kanakia Paris by Kanakia Spaces is a new magnificient residential project which consists of stylish flats located in the lap of Mumbai. Kanakia Paris is placed near metro station(underground) connects Santacruz international airportand Colaba through BKC(Bandra Kurla Complex). It is close by Bandra and Kurla railway stations. The Central & western suburbs are just a few minutes of drive from Kanakia Paris location. It is located just 11 km away from Wadala which is emerging commercial hub. The project is close to places like American School Mumbai, Trident Hotel, Sofitel BKC. It witnesses great access to Navi Mumbai through Sion Panvel highway and South Mumbai and Worli. For those looking for a lavish lifestyle, Kanakia Space at Bandra East is definitely worth consideration. The location of the project is F block, Opposite Ascend International School, Bandra Kurla Complex, Bandra, Mumbai. Kanakia Paris at Bandra East, Mumbai is accompanied by amenities such as gymnasium, indoor games, power backup, high branded elevators, CCTV surveillance, fitness center, conference room, party hall, swimming pool, childrens play area, club house, cafeteria, 24x7 security, maintenance staff, concierge services, firefighting equipment, etc. PVR, Glamour Cinema, Delux Theatres Private Limited.Banks/ ATMs: - SBI ATM, PNB ATM, HDFC Bank ATM, Axis Bank ATM.